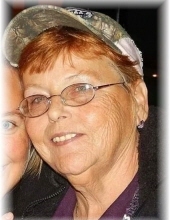 Sharon Kay Himes, 70, of Bowling Green, Ohio passed away March 30, 2019. She was born May 7, 1948 in Upper Sandusky, Ohio to Robert and Mary (Woerner) Williams. Sharon loved crocheting, reading and playing on her computer. She enjoyed attending flea markets and garage sales wither best friend Lottie. She had a special place in her heart for her adored cat Dezi. She is survived by her daughter Rebecca (Jason) Ogg of Pigeon Forge, Tennessee, grandchildren Hannah Herringshaw-Scott of Fostoria, Ohio, Kaylah Herringshaw of Findlay, Ohio, Chaselyn Herringshaw of Pigeon Forge, Tennessee and Austin Ogg of Findlay, Ohio. She is also survived by her siblings Robert (Linda) Williams of North Baltimore, Ohio, Charles Tom (Cheryl) Williams of Cold Springs, Kentucky and Linda Perkins of Perrysburg, Ohio. She was preceded in death by her brother Gene Williams and sister Janet Tiell. Services for Sharon will be private for the family. Arrangements have been entrusted to Dunn Funeral Home in Bowling Green. To send flowers or a remembrance gift to the family of Sharon Kay Himes, please visit our Tribute Store. "Email Address" would like to share the life celebration of Sharon Kay Himes. Click on the "link" to go to share a favorite memory or leave a condolence message for the family.